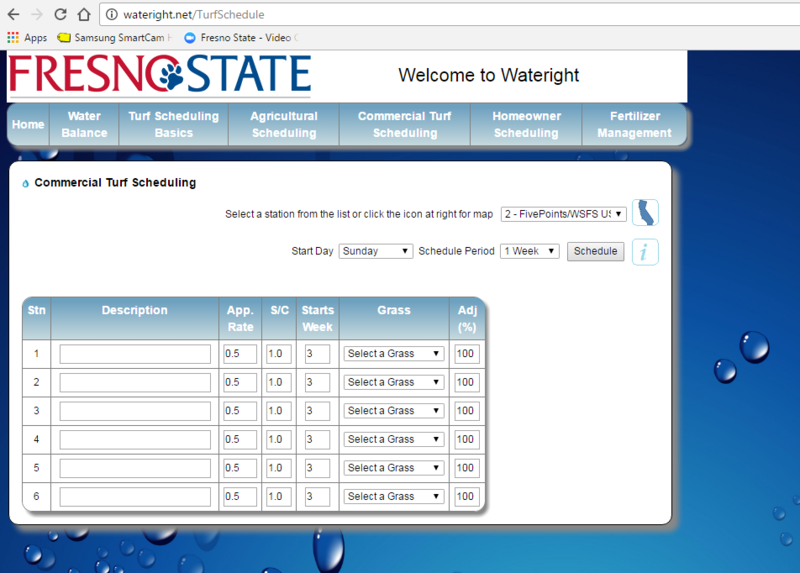 The WATERIGHT site was developed by the Center for Irrigation Technology at California State University, Fresno with significant support from the US Bureau of Reclamation. The website is designed to be a multi-function, educational resource for irrigation water management. The site is designed for three audiences: homeowners, commercial turf growers, and agriculture. WATERIGHT allows growers and homeowners alike to calculate water usage and develop a schedule to better utilize their irrigation systems by simply entering basic information. The user enters in their crop, soil type, and the irrigation system being utilized to calculate a watering schedule. Homeowners are able to use the same program when they enter the type of grass and their irrigation system specifications, which can be done with a simple test, to calculate a watering schedule. The website users are aided by step-by-step instructions. WATERIGHT was recently updated by CIT staff with student assistance and is available to the public at no charge (www.wateright.net). One of the new features is the ability for customers to save their information. Also, highlighted in the new site is root zone based on soil type.